To satisfy the requirements and study the topics necessary for the precalculus CLEP exam, purchase this combination package of the CLEP College Algebra program and the Trigonometry program. The examination and this computer software covers material usually taught in a one-semester precalculus course that includes both college algebra and trig topics. Such a course is usually taken by students who have studied algebra and geometry in high school, but who need additional study of precalculus mathematics before enrolling in calculus and other advanced courses at the college level. The test and this software package contain the same topics as the CLEP precalculus exam. When you purchase this precalculus product, you recieve two software packages (College Algebra and Trig) at a bundle price break of $139. The Precalculus examination evaluates your mastery of skills and concepts required for success in a first-semester calculus course. A large portion of the exam is devoted to testing your understanding of functions and their properties. Many of the questions test your knowledge of specific properties of the following types of functions: linear, quadratic, absolute value, square root, polynomial, rational, exponential, logarithmic, trigonometric, inverse trigonometric, and piecewise-defined. Questions on the exam will present these types of functions symbolically, graphically, verbally, or in tabular form. A solid understanding of these types of functions is at the core of all precalculus courses, and is a prerequisite for enrolling in calculus and other college-level mathematics courses. The examination contains 48 questions, in two sections, to be answered in 90 minutes. Any time you spend on tutorials and providing personal information is in addition to the actual testing time. Section 1: 25 Questions: 50 minutes. The use of an online graphing calculator is allowed for this section. Only some of the questions will require the use of the calculator. Section 2: 23 Questions: 40 minutes. No calculator is allowed for this section. Although most of the questions on the exam are multiple-choice, there are some questions that require you to enter a numerical answer. The subject matter of the Precalculus examination is drawn from the following topics. The percentages indicate the approximate percentage of exam questions on that topic. Typically, how long does it take to complete this particular computer software program? Will this software program prepare me for the precalculus clep test? Yes, if you complete this program and you understand the material you will pass the CLEP exam. 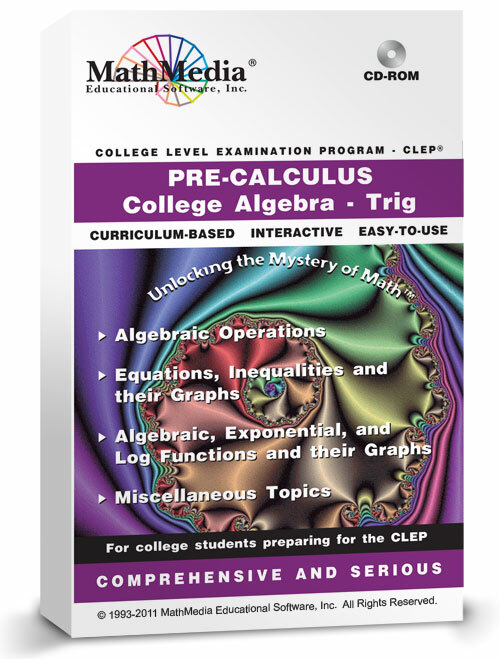 Along with the practice college algebra CLEP test and two practice trigonometry tests, there are over 100 learning sections - these learning sections will take between 30-60 minutes to complete. If you dedicate the time and discipline, you will be successful.